[June 29, 2018] Pictured here is a U.S. Army Sergeant First Class with what we call a Green Tab on the epaulets of his uniform.1 The Green Tab signifies that the soldier is in a leadership position and, as such, commands a sizable amount of respect for the responsibilities he currently holds. In the U.S. Army, there are many soldiers of high rank and yet who are – technically speaking – not leaders. At one time, those leaders were authorized to wear a Green Tab under army regulations.2 The tab signified the wearer had responsibilities that significantly exceeded others of the same rank. The Green Tab is no longer worn. I’m not sure why the army leadership decided to remove it and did so about the time they also instructed us to no longer wear our branch insignia. These insignias were to the casual observer, nothing more than a piece of cloth but to those who lived and breathed army, it was a big deal. I first wore my Green Tab upon promotion to the rank of Infantry Sergeant. I was a Team Leader in charge of a Forward Observer section. Besides being happy that I’d achieved my childhood dream of being a “buck sergeant” I also wore the green felt tab on my epaulets. It meant more responsibility (I now was in charge of 8 men) and signed for about $100,000 in equipment (I would pay out of pocket if my men or I lost any of it). Leaders are given greater responsibilities than others and they relish the challenges involved. No one in their right mind would take on such responsibilities, at no difference in pay or rank, unless there was something to be gained. That gained is greater respect, credibility, and prestige. Ultimately, however, leaders are not here for those things as much as it is because they know they can make a positive difference in the lives who those who follow. Selfless service is what the U.S. military teaches its leaders and that is the epitome of the concept of good leadership. 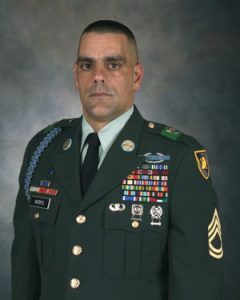 At the following link under www.usmilitaryiaforum.com you will find several more clear photos of U.S. Army leaders wearing the Green Tab. Reader of your blog for many years but never commented. I remember the “green tabs” on soldiers who were in leadership positions. They wore it on not just their Class A uniform but on their utility uniforms also. Thanks for bringing back my memories and for writing an excellent leadership blog. Welcome to the comment section, Doc. I want to encourage anyone reading to make a comment. Thanks. Soon it will be the holiday weekend and the 4th of July quickly. I wish everyone here at https://www.theleadermaker.com a happy 4th and hope everyone enjoys the summer months ahead. Of course, if you’re living “down under” then best wishes for winter. One thing I must say is that the whole idea of responsibility is crucial for the success of the person is no longer taught in the public school system. I have found that administrators and teachers, both, TALK a lot about “leadership” but actually cannot describe it, nor can they teach it. It’s some amorphous term that is a catchall for getting things done. Shame on them for not making the effort to learn more about what leadership is. I wish that I had the kind of guidance as a kid as I see on this website. Growing up in the “big city” made it harder for me to learn some basic lessons that leadership requires. Enjoyed reading your article this morning, General Satterfield. It’s a pleasure to read good stories that help me become a better leader. 😉 I agree too Ronny! Interesting idea that “up or out” policy. It should be adopted everywhere. If it did, we would find fewer people entrenched in jobs that they act as gatekeepers. I hate gatekeepers. Good comment, Max. Yes, I do believe that to be the case that some folks don’t want responsibilities outside being responsible for themselves. However, there are some organizations, like the US military, that requires it at a certain point. In fact, I do believe they have (at least they once had) a policy known as “up or out.” In other words, you were promoted and gained responsibilities or they kicked you out. From my own personal experience, I have discovered that there are simply some people who want absolutely no responsibility except to do their job from 9 to 5 and then go home. These are decent people for the most part and to be respected. However, that is not how the world functions in a modern society. Most individuals will have to have responsibilities and thus the skills to handle it. Without leaders, there will no longer be modern conveniences. Of course, that will not happen. Regardless of the organization of which you are a part, there will be some people with greater responsibility than others. In the majority of cases, two equal people and one with great responsibility, that latter person will be paid more and more likely to gain additional benefits and perks. That is the way it should be. Today, I see that there is a movement to ensure everyone is paid the same irrespective of this. Crazy, huh. I saw that Yusaf was drinking his coffee yesterday morning, enjoying your blog Gen. Satterfield. I’m doing the same today and reading the comments to boot. Looks like you got a significant reaction to yesterday’s article. I guess it hit home. I was in the Army and, yes, I also remember the “green tab” worn on the shoulder tabs by leaders. For those I saw with them, I had a lot more respect and deference to them. Some people are never given the chance to become leaders, so that partly explains why some fear it. I liked today’s blog post. Thanks Gen Satterfield. I never thought about the distinction, whether it mattered or not or whether it was somehow designated. Thanks. I too, like Yusaf, knew of several people who turned down jobs with very good pay for something less when they discovered that they would be held accountable for the actions of others on their team. I was surprised at the time but no longer so. I now see that many do not want the headaches that goes along with being a leader. I had a friend who was offered a higher position in the company we worked for. This was ages ago but I remember him distinctly turning down the offer despite a large increase in pay. His reason? He didn’t want the responsibilities that went along with it. Forgot to mention that my brother did exactly the same thing. He turned down a great job because he would have to “be in charge” of others and thus make sure they were carrying out their duties. After a long talk, he admitted basically that he was afraid of failure in the job. Yusaf, I find this a common occurrence. I know what you mean. I was always this way myself until I was forced to chose between staying employed or not. I could become a team leader for my company or I could find another company to work for. It was the best thing to ever happen to me. Getting responsibilities was a good thing and nothing to fear. Good article today that helps set the record straight on those who hold positions of greater responsibility. The term “green tabber” or just “green tab” does mean a lot even still today. Thanks for pointing out that there are those willing to step up and do the hard work necessary to be a leader.